Some of the informations might not be true but those are my observations after 3 matches. Figured out the important mechanics and some tricks. Hope you find this useful! There are 3 phases in total. You have to deplete its shield with certain damage types in order to damage it. 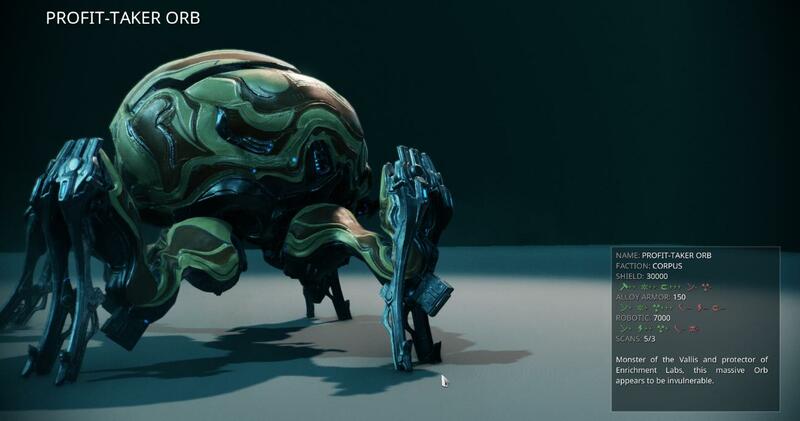 There is a damage type indicator on its head that shows which it is vulnerable to. It changes occasionally or when shield is damaged to a certain threshold. Similar to Jackal, you have to take down the limbs in order to damage its torso. Ending a phase once you damage it to a certain point. You can only use your Arch-Gun to damage its health. Ammo reserve is very limited so take aim. Last phase is timed when it starts. Failing to defeat the Orb Taker in the timeframe will result in failing the boss fight. When it dies, it will start its self-destruct sequence which is a wide area nuke that instantly kills you if in the vicinity. Shattering Impact can deplete its armor completely. The more damage types you have in the team, the more opportunities you have to damage its shield. 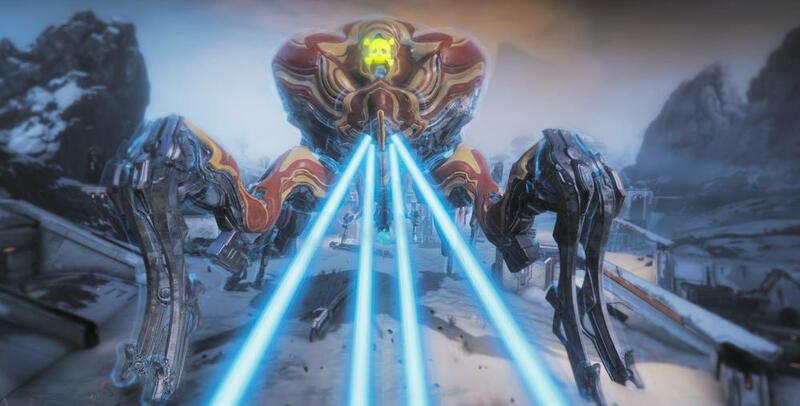 Simply use Itzal archwing to quickly absorb all the loot under the orb taker, then hightail your way back to Fortuna. Damage types can be literally any physical/elemental damage type so taking weapons with physical properties might be an optimal choice. 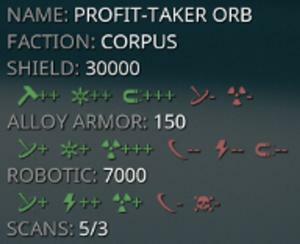 You can manually switch the damage type by dealing void damage. By picking up Arch-Gun ammo while it is on cooldown, you can reset the cooldown time to 0. Here's my approaches when I was fighting the boss. 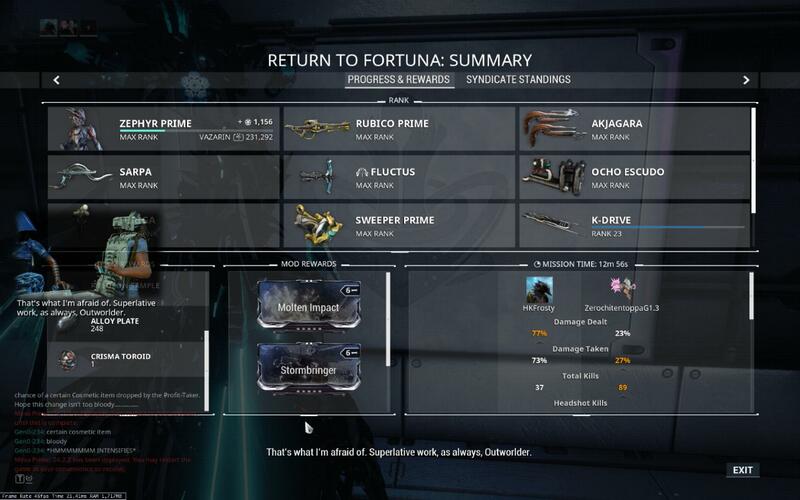 I tried using Lanka and modding extreme damage for 1 damage type. Waiting for the boss to switch to the damage type didn't work out too well for me. I grabbed a friend of mine and tried to fit in as much damage types as we could. It worked but I constantly forgot which damage types I had within my weapons. That might be a problem if you are doing solo. While I suggest not to care about its shield resistances and vulnerabilities, You might need it if you are going to solo and need whatever hits most. 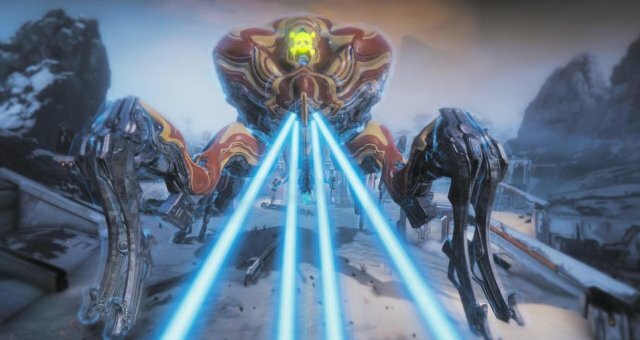 Basically, if you can strip its armor, take electricity on Arch-Gun for higher damage against its health. If you can't, radiation might be your best option.